EXOS Aerospace Systems & Technologies, Inc. has announced a new launch date for their newest vehicle, SARGE. 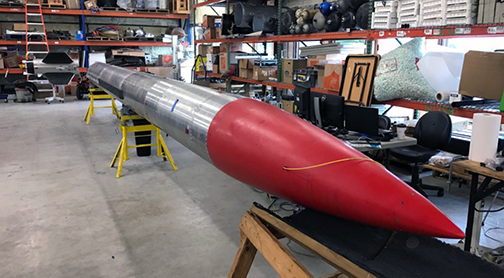 The first SARGE suborbital rocket, developed by Exos Aerospace, is prepared for a "pathfinder" launch now scheduled for Aug. 25 from Spaceport America in New Mexico. Photo is courtesy of Exos Aerospace. EXOS has completed the design, build, and test of their latest platform, completed fully integrated hover testing, received their Launch License, and is making final preparation for their Pathfinder test flight on August 25, 2018. A successful Pathfinder test flight of the SARGE reusable system will solidify the company’s plan to use this technology as the design basis of their reusable (first stage) of a 100-200 kg, 200-400 km capable orbital-class vehicle. This also brings EXOS a critical step closer to providing suborbital services to the smallsat community by providing frequent access to test up to 50 kg. satellites in space (3 to 4 minutes) and then return them to the launch site (just 20 minutes after their launch). John Quinn, EXOS COO, said that the company is excited to enter into the testing phase of the firm's SARGE platform at Spaceport America and looks forward to enabling space research, manufacturing, and educational opportunity for the world by providing frequent flights that provide fast and affordable access to space. The company is even more excited to reveal plans for the company's Jaguar Reusable (first stage) LEO launcher. Since the SARGE rocket is designed for reusability, it is proving to be an excellent risk mitigation platform for the firm's orbital technology development program and helping to drive space access costs down. The software and technologies EXOS has developed are key to development of the reusable first stage of the company's planned Jaguar vehicle. SARGE and jaguar will use NASA’s Morpheus flight code (acquired through a Space Act Agreement) which was modified by a team of scientists from EXOS, Intuitive Machines, C-Squared Systems, Helios, and XISP, Inc.
Quinn added that Once the company achieves a successful test of the SARGE platform, that platform will be used to develop live dynamic condition assessment and prognostics system evaluation programs that will help EXOS predict vehicle RUL (Remaining Useful Life) as a feed forward to reduce risk in the company's Orbital program. EXOS has built SARGE to be overly robust until there is sufficient flight data to where weight can be shaved off, while still leaving plenty of margin for repeated reuse. EXOS designed the rocket system to support as many as 200 flights; however, the company proposes to use the Lox Ethanol vehicle as long as it’s “safe” — the firm ultimately desires to sell the liquid fired rockets to MDA as “hard to acquire” targets as they near the end of their economically viable life.